You sit in the middle of the black leather couch, tense figures on either side of you. You sip from the cup of coffee you've brought in with you; it's overly sweet and only lukewarm, the syrup of the flavour shot coating the inside of your cheeks. "A pair of golden carp is used in several cultures to symbolize love, partnership, renewal, and abundance,"
"Yet it's nearly unheard of to have three people within a soulmate partnership." You never imagined you'd have to actually go to soulmate counselling, yet here you sit. "But you're sure my tattoo matches with both of theirs?" "I've seen cases of three soulmates before, but there has never been a case of a tattoo split in half like this, yet matching another perfectly when put together. I'm still astonished the three of you found each other in the first place." You've seen the markings thousands of times, but there's no denying it-- putting Tanaka's and Yamamoto's tattoos together creates the image of a carp exactly like yours, down to every scale and minute detail. You've constantly been advised that tattoos between soulmate pairs are so distinctly different, that there's no chance of you ever finding someone with a marking that resembles anything close to yours-- unless they were your soulmate, of course. "Yo, (Y/N). No sweat, we'll get to the bottom of this. Okay?" You look up, suddenly wondering why you were even worried in the first place. Maybe not so much worried as you are curious, but concerned, nonetheless. Would your friends see you as weird? And what about your parents? On your other side, Tanaka squeezes your hand in reassurance. It's going to be okay, you think, as long as I've got these two. "I've... I've seen a similar case happen before, though the tattoos formed an evenly dispersed group of three. However, a different theory comes to mind. And it's not a very rational one, either." The three of you lean forward in anticipation, taking one last shot at visiting a "soulmate expert"-- you have no idea what degree you need to get to become one, honestly-- but your friend recommended him, at least. The abundance of strange plants, hopefully fake skulls, and mystic decorations against saffron walls in the room don't help your skepticism, however. "Some otherworldly theories propose... the reincarnation of soulmates. Those that find each other lifetime, after lifetime, though they may never realize it." Your eyebrows furrow and you grit your teeth in thought. Is he implying that the three of you have experienced this in before? You shake your head. Now you're believing in his weird, supernatural theories. "And there may be times where a soul splits." You glance between the two boys, now noting their similarities more than ever-- you can't believe you're actually considering this guy's words, but oddly enough, it's the most plausible theory you've encountered so far. "Y-you're not saying what I think you're saying, are you?!" The two high-five with a resounding cheer, and relief washes over you like a tidal wave in the form of an ear-to-ear grin. Even the counsellor in front of you joins in with a slight laugh, and he says something about his theory not necessarily being completely true, but at this point, you don't care. Somehow, you start to believe that some things are just meant to happen. Sure, there are times that you doubt whether you belong in this relationship. "Ryu, pass me the damn screws." "Huuuuuh? You literally asked for them a second ago." "And I gave them back to you!" And you always wonder if you're the odd one out. "Did... did we just build the whole thing upside down?" "Goddamit, Take! I literally told you we shouldn't have started from there!" "No, I told you it was a bad idea to buy an Ikea chair in the first place!" Is a relationship so rare even possible? "Boys... you know you just have to flip it so it's right side up, right?" "(Y/N), I don't know what we'd do without you!" But at the end of the day, something tells you that you simply belong. As part of my Flavour Requests. I will admit this was difficult to write, so thank you for requesting as it really made me think! I struggled to come up with a theme and I think most of it is reader being a bit anxious having two soulmates (even though it's technically one) and feeling like their tattoos match and hers doesn't as much but slowly she comes to terms with it the more she realizes they're both there for her and the kind of people she wants in her life! The flavour themes were a little more difficult to place in there so it's more the feelings I got from both if that makes sense? Molasses being slow and sweet, and saffron being rare and valuable? That a wonderful fanfiction. Hahaha I loved it so much. You sigh in relief as the bell rings, signalling the end of the world's most boring biology class. Just in time, too-- your stomach's grumbling, and it's finally time for some lunch. Being a senior meant being the top of the high school food chain-- but that didn't come without harder classes, all-nighters, and stressful decisions about college. Frankly, you were getting exhausted-- and today, you definitely needed something to lift your spirits. Your stress relief begins as a single red rose being placed in front of you immediately after you step foot outside your classroom. Your words trail off as you notice more people in a line behind him, each holding a rose of their own. Every morning, your routine is the same. You slam the button on your alarm clock, roll out of bed, put your school uniform on, grab some food, and walk down the same path to school. You cross the main road, walk through the small forest, make your way over across the creek, and enter the parkette. Every morning, you take out a small bag of treats, fruit, and meat, as you approach the clearing where your friend greets you. "Yuu! Nice to see you this morning!" A tail-wagging Shiba Inu peeks out from behind the bushes, cautious and meek as ever. But as always, he warms up to you quite fast when you hold out the food in your hand. The stray never had a tag on, so you referred to him as Yuu-- meaning shy or gentle, the name inspired by its docile nature. ‘You’re a monster!’ Was written in messy scrawl on the back of his hand, he hated it. Yeah, sure his team dubbed him the ‘Guess Monster’ but to be called a monster by his soulmate disheartened him. Did that phrase mean instant rejection? Were they disappointed in what they saw? Would he be forever alone? On the outside, he would joke about it coming off as uncaring but on the inside he was in turmoil. 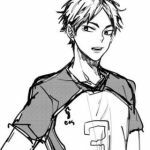 No one ever approached him outside of volleyball so he thought it would be someone on the volleyball court, an opponent. Tendō wasn’t sure how he felt about that he didn’t swing that way. Maybe it was some kind of joke for his warped personality. What bothered him the most was that it was written on the back of his hand, where everyone could see it, where he could see it, every day. Tendō would take a sharpie and color over it or use sports tape to cover it up but then the questions would follow. 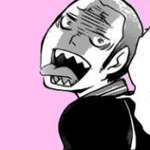 Tanaka was wandering the halls of Karasuno without really paying attention to where he was going. It was frustrating. That bitter feeling of having scratched and crawled their way up to be beaten by that Oikawa and his Aobajosai team. And they'd been especially hard on Tanaka himself for part of the game, trying to break his spirit and his nerves. It made him want to hit something, he was so frustrated with the results. He paused, turning slightly to see who was calling him. And he started slightly at seeing you behind him. “Morning, Kei-kun. Is Aki up yet?” The tall teen turned at the sound of your voice; face scrunched with displeasure at the interruption. “I dunno. Maybe,” he said with a noncommittal shrug. "Twelve ounce vanilla latte please." "Aren't you supposed to be in high school right now?" You looked up from fishing a gift card from your wallet, examining the carrot-headed barista leaning on the counter with pomegranate gold eyes glittering in amusement with a touch of curiosity. Raising a brow, you tilted your head slightly. "I graduated a year ago, but you look like you could still be in high school yourself." The boy huffed, standing himself straight. "I've grown taller y'know." You couldn't help the small smile that tugged at the corner of your lips, handing him your card to be scanned. "I never said you were short?" After swiping the gift card, the boy raised his eyebrows as he inspected the card. "You new here?" Shrugging as you took the card and placed it back into your wallet, you shot him a smile. "Yeah, a friend recommended it to me. You guys any good?" The blur of passengers brisk walking to and fro surrounded you, signs written both in English and Japanese illuminating overhead. The squealing of luggage wheels rang with the intercom bell pings, serenading airport passengers. You allowed yourself to drown in your own thoughts while standing patiently in front of the baggage conveyor belt, waiting for your checked-in belongings to come in sight. You’ve never went on a solo trip before, since you were always with your family; and this trip made you feel uneasy yet excited at the same time. Deciding to go to an immersive trip in Japan was not an easy choice – though you were quite confident in your skills with the Japanese language since you’ve studied it for 3 years, you still felt that somewhere in between this trip, you’d make a fool out of yourself. Sighing, you grabbed the baggage and started to walk towards the exit, all the while reassuring your nervous self. He was her everything, her world. His small compliments made her day, just a slight look from him could make her smile or giggle to her self. Though, Tanaka and [First name] were not a thing, she often found her self disappointed when he gave other women compliments. Any woman he found attractive he gravitated to and it hurt like hell to listen or watch. She had been friends with the male for quite some time, and found her heart pounding when he gave her a pat on the back or told her she looked nice. Around her, he did not act the same as he had around any other woman. He did not just flaunt off his nice words, or push them onto her. He subtly gave them, and genuinely meant them. His voice broke your silent dispute with the air conditioning unit, making you turn your face to meet his eyes, shivering ever so slightly all the while. “No, it’s fine.” You said in a quiet voice, not wanting to wake up the other volleyball members who were sleeping inside the bus. You laid your head on his shoulder, watching the scenery pass by rapidly as you looked outside the window. Without warning, he wrapped one of his arms around you, with his hands finding their way to yours. A blush adorned your face as you suddenly found yourself flushed to his chest, which you found was warm and comfortable. He nuzzled his face to your hair, taking a deep breath of your vanilla scent before exhaling blithely. A bashful smile slowly appeared on your lips, and you closed your eyes as you resigned to the warmth of his embrace. Typically, soulmate marks didn’t appear until an individual was ten years old the universe deciding that it was then they would understand the meaning. That was the current situation with Yamaguchi, his had not shown up at all. “You’re nothing but a loser without a soulmate!” A cruel boy teased having taken Yamaguchi’s backpack tossed it behind him followed by shoving him back causing him to trip over it landing harshly on the ground. Yamaguchi held in his tears by biting his cheek staring up at the bully his lips pulled into a tight line. Suddenly a shadow loomed overhead fear appearing on the bullies’ faces. “Lame,” a condescending tone remarked a smirk plastered on their face. Fear rose in the bullies at the sight of a severe expression on the taller boys face. “See you around Yama-loser,” they called out striding off tails tucked between their legs. Tendou Satori has an obsession. It's not the creepy kind - well, at least he thinks it isn't. But he's obsessed with the sound of [Name]'s laugh. Not the ones she makes to be polite, or the ones she fakes to convince people that she's fine. It's that full-blown laugh of hers that Tendou loves; The uncontrollable gasps and giggles, the occasional snorts, the tears that sometimes squeeze out of her eyes when she laughs hard enough. He doesn't know whether it's normal that his heart kind of contracts whenever she laughs like that, reminding him of how much he loves it. Loves... Her. And watching her laugh, knowing the fact that it's him making her laugh... A satisfied smile - or maybe it was more like a smirk - rises to his face as he loosens his hold on her waist and his fingers slowly cease their attacks against her stomach. He wasn't exactly tickling it, but who knew lightly jabbing her stomach worked too? "There you go." There's your lovely laugh and smile. 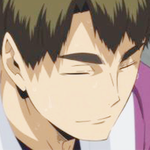 You have been dating Ushijima since the first year of high school. Neither of you remembers who asked first – it all went smoothly: first, as you were in the same class as him, you were meant to speak to each other, even if you were not talkative – and neither was he, but you somehow managed to get along together. Then, as you both became the captains of your clubs – athletics for you, you were meant to speak and to meet more together. And one day, you noticed that you were dating him – that was what the other said when they first saw you kissing after your club's activities. But you were indeed dating him. Neither of you remembers who kissed first, who took the other's hand first nor who said the three magic words first. Actually, both of you never did say those words. You both never doubted your feelings for each other and you both knew, with little attention, that he loved you and you loved him.